2006-09-12  The derby between Australia and New Zealand turned out to be a rather one-sided story, as Australia won 7:1. 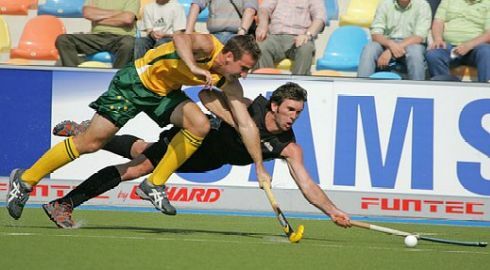 The Kookaburras have grown better from match to match and dominated the Black Sticks, that also displayed many defensive mistakes, at will. Australia has reached the semi-finals, with New Zealand's hopes gone. The second match saw many goals again, as Japan had the better end versus Argentine with 4:3 and won their first points, thus theoretically still having a chance to leave the lower end of pool A. Argentine has finished the qualification round and currently ranks fourth. Germany in the third match never was in danger of losing the match, as they defeated South Africa 5:0 without being forced to go to the limit. Now Germany has to get one point out of tomorrow's match against Korea to reach the next round. South Africa ranks second last in pool B. Worth mentioning is the fact that during this encounter Sebastian Biederlack scored the 100th goal of the BDO World Cup. That result meant that in the last match of day seven Netherlands had to win. It was Taeke Taekema who with five goals paved the road to success, with the Dutch defeating India 6:1. Holland now leads pool B with ten points as Germany and Korea too, but with them encountering each other tomorrow the Dutch depend on the outcome of that very match and must hope for anything but a draw.